Recently, we had a chance to chat with Melanie Collins, host of Wilson’s Driver vs Driver Season 2, which airs on the Golf Channel. The show has contestants submit and refine their design for a new driver. The winning designer gets a cash prize ($250,000 for Season 2) but more importantly, in our eyes, their design is brought to market by Wilson Golf. Our conversation with Melanie ranged from her Season 1 experiences to Season 2 expectations, and more. Read on to find out what she shared with us. GlobalGolf: What was it like being involved in Season 1 of Driver vs Driver? Melanie Collins: Season 1 was really cool because it was obviously the first time we were doing the show. I think it was that a really great learning experience. I didn’t have any clue what all went into creating a driver. To be able to see the process through, see how long things take; there’s just so much more involved in creating a driver than I ever knew. In Season 1, we didn’t quite narrow down the ideas like we did for Season 2. We saw some really hilarious, innovative, and creative ideas for these drivers. I think that was the coolest part about Season 1, was just seeing the really cool ideas come together. GG: Definitely. How did you become involved in the Series? MC: I had hosted The Big Break for Golf Channel for about 3 years. Then I was lucky enough to meet the guys from Wilson Golf and I was asked to host the show. We got a great group of judges together and that’s how I started. GG: What did you learn about Wilson as a company overall throughout your time together? They’re very risk-taking, which I think is so important in a company, to be able to take risks and try out new ideas. I think it up ended up being a big success for them. So, I would just say great people overall and innovative risk takers that are willing to try something new. GG: You mentioned how you gained a great appreciation for what goes into the design of a driver with Season 1. Is there anything else you took away about what goes into a club? MC: Season 1 was very much about the whole process, the CAD designers and how they go in and change up the design so that when a person that’s into golf and familiar with golf, when they look down at the club they like what they see. I never knew how much players like the sound of a ball coming off the club or how much the look matters to them when they’re standing at address. I think one of the coolest things from Season 1 to Season 2 is that Season 2 is a lot less about the creation of the golf club and more about field testing. Everyone wants to know that the club actually works, will people actually love the club. We had Wilson Staff Advisory players Brendan Steele, Kevin Streelman, Ricky Barnes, and Troy Merritt hit the clubs multiple times at different stages in the process. Then, we went out to the American Century Championship in Lake Tahoe and we had celebrities and athletes with single digit handicaps hit the clubs and give us their opinions on them. They told us what they liked and what they didn’t like. Next, we went down to the PGA Merchandise Show in Orlando and we had the general public hit the clubs there. Now, when Wilson puts this driver on the shelves, we know a lot more about what that the public and what golfers are going to feel about the club. GG: Transitioning over to Driver vs Driver Season 2 a little bit more, besides the field testing, what else can viewers expect that’s different from Season 2 compared to Season 1? MC: I would say the ideas are much better. They’re much more innovative, more on par with what we were looking for, to begin with. The ages of the contestants on Season 2 are also amazing. The youngest contest on the show, of the fourteen finalists, is 22 years old and the oldest is 81! It’s a really cool age range and range of different people with different backgrounds. GG: Does this give Season 2 a new feel compared to Season 1? MC: Yes, I would say it does. It feels much more like a close elimination-style competition show and less like a documentary on how to create a driver. I’m not saying that Season 1 was like that but I just think it’s much more of ‘Let’s watch PGA Tour players hit the club and get their feedback’. I think Season 1 had a lot less of that. It was more about the design and the approach to building the driver. GG: Yes, because everybody wants to know how this [driver] is going to perform for them, how does it stack up with what they currently play? MC: Exactly. The performance is everything. Every episode, there’s someone else hitting it and giving their opinion. For example, one of our judges, Rick Shiels, is a PGA Professional and golf equipment expert and he knows exactly what to look for. GG: Besides Rick, Jeremy Roenick is a new judge and, of course, Tim Clarke is back. What does Jeremy bring to the table and what more does Tim bring to the table for Season 2? MC: Jeremy is so fun to work with. He’s a tough, honest, a Simon Cowell-type judge. He’s very brutally honest but really entertaining. He represents the consumer for us. He’s a single-digit handicap and plays golf all the time, all over the world. He’s our judge with tough love. Rick’s more like the nice judge. I think they make a nice pairing. Tim Clarke, of course, is amazing. He’s the president Wilson Golf and he knows we wants. After going through Season 1, I think he’s much more honed in on exactly what they’re looking for and what will work and what won’t work. He’s been able to toughen up a bit too in Season 2. He’s able to eliminate guys with a little more authority. It’s a really cool mix of judges. GG: Can you talk about some of your favorite parts of Season Two so far? MC: I loved the PGA Merchandise Show! That was really cool to get to meet people and have them hit the clubs. I think my favorite part was going out to the American Century Championship in Lake Tahoe. Seeing professional athletes, NFL coaches, and celebrities hit these clubs, they’d tell us that they like the sound or didn’t like the sound, this one performed well, this one didn’t, or this one’s too shiny on the top. That was my favorite part, going out to Lake Tahoe and just having people that are really ingrained in golf clubs hit the clubs. It helped us to really narrow down what we think is going to be an incredible product. GG: Did you have any favorite submissions this year, sort of like the ‘Wilson Whistle’ from Season 1? MC: I would say that was my favorite. There’s a lot less of that in Season 2, though. People knew what to expect with their submissions and they knew that none of that was actually going to get them anywhere. GG: That wraps up all the questions we had, Melanie. Thank you for taking the time to chat with us. 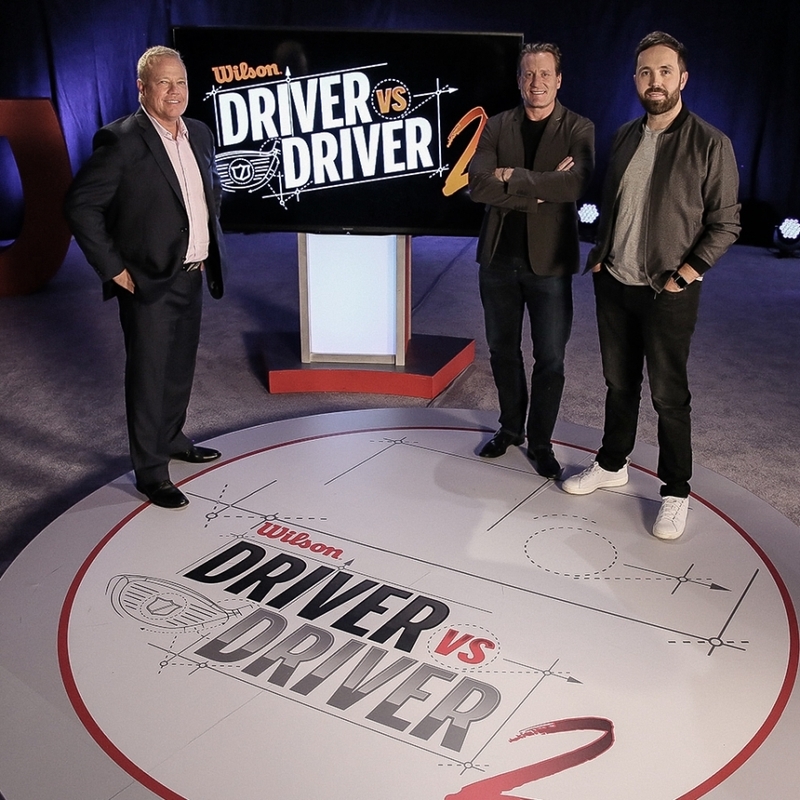 We’re looking forward to watching Season 2 of Driver vs Driver! MC: Thank you, guys. Have a great day! Driver vs Driver Season 2 begins airing on the Golf Channel on Tuesday, October 2nd, at 9pm EST. For the complete schedule of the show, head HERE.